Synopsis: Set in the Northern Song dynasty, the story revolves around Sheng Minglan, the unfavoured sixth daughter of an official. After being mistreated by her legal mother and bullied by her half-sisters, Minglan learns to hide her skills and true intentions and, ultimately succeeds in avenging her biological mother’s death. She meets Gu Tingye, who initially dislikes her but after witnessing her wits and intelligence, decides to help her. They eventually fall in love with each other. After Gu Tingye becomes a powerful official, he successfully makes Minglan his wife. As his wife, Minglan helps guard against his unpleasant relatives and purges the court of corrupt ministers. The couple eventually earned their happily-ever-after, and Minglan rose to prominence as an influential figure of the Sheng family. Gosh, this drama is hard to describe. First off, it’s slow. The pacing is slow but perfect at the same time. Not much has happened but at the same time, a lot has happened. The first 5 episodes were mainly focused on young Minglan, who is birthed by a concubine. That makes her status in the family lower than the children of the main wife and the children of the favorite concubine. And that also set the dynamic of the family. We kind of see who has the upper hand, the relationship between the main wife and the concubine, and even the servants of the house. Because of their unfavored status, Minglan’s court is bullied and cheated off of charcoal that keeps the household warm. Even at a young age, Minglan is matured enough to know this and hence she wants to keep her pregnant mother safe. Unfortunately, due to the underhand play of the concubine, Minglan’s mother died of stillbirth. (We see some interactions between our main leads here where Gu Tingye helped Minglan find a physician for her mother). Minglan, who lost her mother at a tender age of 8, moved in with her grandmother. Luckily, her grandmother dotes on her and does what she can to keep Minglan safe. It’s interesting that they started off the story with Qi Heng’s love interest for Minglan. It’s cute how he tries to pursue her and how she tries to avoid him. Minglan knows that her status as not only a concubine’s daughter but also the daughter of only a 5th rank official will never be on par with Qi Hen’s status (the only son from the house of ducal). Qi Hen is a sincere guy but unfortunately, he doesn’t know the hardship that a woman of that time faces. Also, he’s a prideful, confident guy who thinks that he has the power to protect the woman he loves. Whereas, Minglan is self-aware of the turmoil that happens behind the scene. I really like their interaction and Zhu Yilong is killing it as Qi Hen! That innocent and naive personality of his makes me wonder what development will his character undergo. Especially after Minglan marries Gu Tingye. Like I say, the plot is slow but at the same time, I find myself rewinding every fast forwarded part because a missed conversation leaves me a little clueless. It’s slow but I find myself hanging on to every scene because it ties to the next. There are a lot of families and relationships that I’m still trying to grasp and their titles make it hard to understand. hahah But that makes the dynamic of the story fun to watch. And last, not to be biased but Zhao Liying is doing an awesome job here. Innocent and playful but so smart and cunning. She lays her pieces behind her grandmother’s present and plays the mindless 15-year girl that she pretends to be. Behind that chicken scratch writing of hers, she is insightful and observant. It’s subtle but obvious in how she orchestrates the pecking orders of her servants after becoming the steward of the house, how she “innocently” walks the nanny out to witness the affairs between her third brother and the maid, how she makes her second brother wait so that the maid can make her move (and how the second brother reacted! lol). I love her character! She reminds me of Weiyoung from Princess Weiyoung except less cruel. Can’t wait to see how her character develops. (I’m glad that she’s not being picked on as much as I had thought she would be! I knew they would make changes compared to the novel which is fine overall. However, some of Ming Lan’s characterization does annoy me. Some obvious story elements were changed so that Ming Lan stood out when it didn’t make any sense. Like in the recent episodes when Ming Lan and Ruo Lan went to get the document of the prostitute to help Shu Lan in her divorce with Sun Xiu Cai. I understand Ming Lan is the female lead and she needs the glory but these changes wouldn’t make sense in the setting at that time. Right now I’m over Qi Heng and is waiting for his story to end lol His arc is dragging but luckily GTY is growing as a man. I much prefer his development as a character than Qi Heng and his fruitless love. I do enjoy the changes made to GTY and his encounter with Ming Lan. These are areas I approve because in the novel you don’t find many descriptions about his experiences since everything is from Ming Lan’s point of view. Also is it just me but the big confrontations within the series seem lacking? I expected the divorce of Shu Lan to be more intense but I never felt that from the drama. Another scene is when the mother comes to Ming Lan’s area and disciplines the maids. I found the only scene done well was the one where all three Lan’s were being scolded from the older lady while they were being taught manners. I’ve started re-reading the novel again to refresh myself. I’m watching it with my GF who is a huge fan of the book series. So far the plot and style is a combination of Pride and Prejudice and Dream of the Red Chamber. 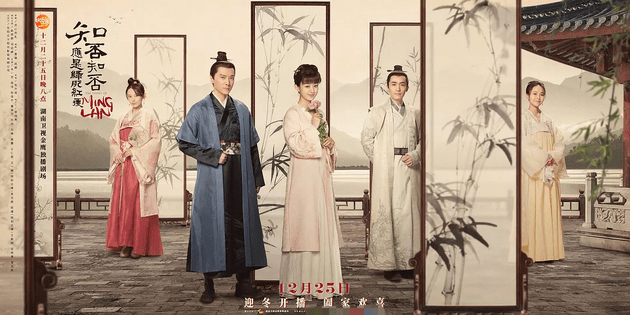 Overall, the series feel more setting driven rather than character driven, thus similar to something like Downton Abbey rather than the usual Chinese and Korean court/historical drama. Downtown abbey is a good comparison. I think this is why people have a hard time getting into the story. The time lapse in the story is very consistent unlike most stories where time jumps base on event to event. When I watched it, it immediately gave me the Dream of the Red Chamber vibe. I am following each episode as they come out or at least try to. Right now I am on episode 19 and I really like it. Everything is working for me, acting is really great. I am even a fan of GTY and avoided the second lead syndrome. I really feel for GTY even if he has done a lot of bad things, he had such a hard upbringing that I hope he can open his eyes and find happiness. hahaha. GTY has little scenes so far so I’m indifferent to his character atm. I like Minglan and Qi Hen’s relationship but i’m not rooting for them because that just means a tough future for her. I’m excited to see more of GTY and ML’s interaction. I love the cast too! Everyone just fit so perfectly. =D I caught up in one sitting. I just feel for him, his family is despicable. Yeah I dont think QH would make a good husband either because he doesnt understand the reality of certain situations. Casting is so onpoint and everyone is acting so well. I just love the whole cast. Yea. QH would not be able to protect her in the backcourt of his home. And we kinda see that already in how he handles the marriage proposal situation. Indeed, QH is a bit of a mama’s boy. And princess is very concience of rank and how she and by extention her family outranks pretty much anyone. I think during the first few episodes is best just to focus on the main family, the rest is not as important and you will catch up on the plot in the following episodes. yeah, it is not that important earlier on. I remember I had to watch the first few episodes of Nirvana like three times to really understand all the connections since it was essential to the plot and there were too many people. But on Minglan, I just kept on watching and in the later episodes the connections between the families were better explained imo and everything kind of fit in.